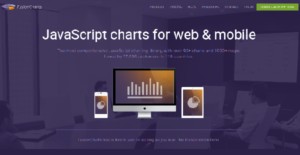 FusionCharts XT – This flagship product comes with over 40 chart types, including column and chart bars, line and area charts, 2D and 3D Pie charts, Zoom and Scroll charts to name a few. FusionWidgets XT – Ideal for adding more insights to KPIs and real-time data dashboards, monitors, and reports. Charts included here are Gauges, Gantt Charts, Spark Charts, and Budget Charts among others. PowerCharts XT – A selection of advanced charting widgets intended for domain-specific usage like network diagrams, financial planning, stock price plotting, etc. Charts in this product include tree maps, heat maps, waterfall charts, spider charts, and multi-level pie charts. FusionMaps XT – Offers over 1400+ geographical maps, including all countries, US states, and regions in Europe. Perfect for regional/geographical plotting business data such as revenue, population, employment level, and so on. Creating charts can be time-intensive unless you are using FusionCharts. A few clicks and tweaks and you will have your charts built from the ground up in minutes, not hours or days. With its copy and paste functionality, awesome demos that empower and teach you the best practices and exhaustive documentation, creating charts becomes a breeze. You basically save a lot of time. Not to mention you are able to craft appealing, compelling charts. Even with its plethora of demos, documentation, and user-friendly features, there will be times that you will need support. FusionCharts fields a team of experts who are knowledgeable and will help you with your tasks. That is if you opt for their premium package, which you will find definitely worth the investment. If you are interested in FusionCharts it could also be sensible to check out other subcategories of Best Data Visualization Software gathered in our base of SaaS software reviews. Every organization has different wants and needs a software that can be customized for their size, kind of employees and customers, and the specific industry they are in. For these reasons, no software can provide perfect features out-of-the-box. When you look for a software product, first be sure what you want it for. Read some FusionCharts reviews and ask yourself do you need basic tools or do you need advanced tools? Are there any industry-specific tools that you are searching for? Find the answers to these questions to help your search. There are lots of elements that you need to reflect on and these include your budget, particular business needs, your organization size, integration requirements etc. Take your time, try out a few free trials, and finally zero in on the platform that provides all that you want to enhance your firm competence and productivity. How Much Does FusionCharts Cost? We realize that when you make a decision to buy Data Visualization Software it’s important not only to see how experts evaluate it in their reviews, but also to find out if the real people and companies that buy it are actually satisfied with the product. That’s why we’ve created our behavior-based Customer Satisfaction Algorithm™ that gathers customer reviews, comments and FusionCharts reviews across a wide range of social media sites. The data is then presented in an easy to digest form showing how many people had positive and negative experience with FusionCharts. With that information at hand you should be equipped to make an informed buying decision that you won’t regret. What are FusionCharts pricing details? What integrations are available for FusionCharts? If you need more information about FusionCharts or you simply have a question let us know what you need and we’ll forward your request directly to the vendor.